Hi techintor.com fans, Here we are sharing a new trick for reliance jio users. this time it’s free caller tone. get jio free caller tune in your reliance jio sim for 1 month by following this article. I think all of you already know about jio and jio’s welcome offer which was trending nowadays. Anyway this article is not about it, here you are going to know about how to get free caller tune in your jio sim. Jio started callertune services now and offering free callertune for their users. Actually here you don’t need to do any tricks, it’s a official from jio. Jio is surprising their users by providing more and more amazing offer daily. they are already providing their all premium services like jio music , jio tv , jio movies for free. Now they are providing free caller tone for 1 month, but of course there will be some extending offers too. 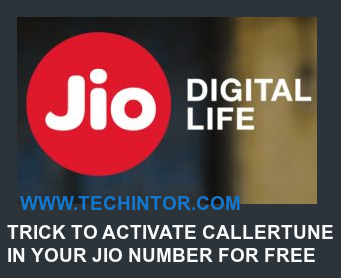 If you are a jio user then this is the best time to activate callertune in your jio number for free. There are lots of hellotunes are providing free. If you are not a jio user, then go and get jio sim with welcome offer now – click here. First of all open your messaging app. If you are a VoLTE user then open your default system messaging app. if you are a NonVoLTE user then open Jio4GVoice app. after sending this message, you will receive a message from jio. then reply to that message with your choices. Finally you will get a message to confirm the activation of caller tune. just send ‘Y’ to confirm the activation of free caller tune. Congrats you are activated caller tune in your jio sim for free for 30 days. enjoy jio free caller tune service. Just repeat the above steps again after 30 days. This way you can extend your jio free caller tune service after 30 days usage. 1.open your messaging app. If you are a VoLTE user then open your default system messaging app. if you are a NonVoLTE user then open Jio4GVoice app. 3. You are successfully removed callertune from your jio number. movie – sanam teri kasam .